Home > Diving > What is Drift Diving? If you enjoy the thrill of underwater exploration but not so much the effort and technique involved, drift diving is a relaxing and exhilarating experience where the current carries you along. Unlike open water diving, drift diving is not defined by equipment or technique, but by location and water currents. Whereas a scuba diver would typically propel themselves wherever they choose by swimming and kicking the fins, the drift driver simply descends into water with a known current and then lets the water flow take control. It is a very different way to experience the marine world because no longer are you slowly swimming around, absorbing your surroundings and stopping to study sights of interest, but instead you drift effortlessly through the water in the direction the sea wants to take you, and watch as the sealife floats by. As the diver is not exerting himself by swimming, he uses less air and therefore can stay underwater for longer using a single tank. The swift movement combined with the lack of exertion has led to fans describing it as the most relaxing and enjoyable diving experience there is. The experience depends on the speed of the current, which can vary the dive from a pleasant drift to an exhilarating rush akin to flying underwater. A slow drift would be around one knot - which might sound very slow but it feels a lot faster at depth – and a very fast current would be around four knots. The fast speeds provide an exciting heart thumping ride, where plants, rocks and fish fly past in a giddy whirl. Drift diving is clearly not ideal for divers wanting to explore and study the underwater habitats and formations carefully and under their own steam. Nevertheless, with good visibility the drift diver can still absorb a lot of their marine surroundings and, as they typically cover a greater distance, they might even get to see more of them. In giving yourself up to the elements, drift diving may in practice be a free and wild form of diving but it still demands precautionary measures and careful planning in order for it to be carried out safely. Participants need to employ a surface-marker buoy (SMB) system both so that a dive boat or surface crew can follow you and to let other boats know there are divers in the water. They also should also carry an appropriate signalling device and compass in case they become separated from their diving buddy or group. Drift dives also have to be planned carefully beforehand. For instance, it is necessary to first determine the direction of tidal currents as well as their strength, in order to avoid divers being swept away into hazardous areas. 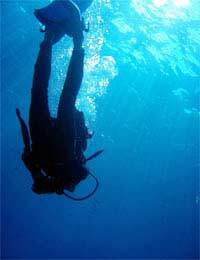 It also demands that divers are experienced in regular diving before they try this offshoot. Drift divers need to be trained to Open Water level at the very least. The Professional Association of Diving Instructors (PADI) run a speciality drift diving course that you can opt for when doing an Advanced Open Water course. The study will increase your understanding about buoyancy control, the different lines and reels used with SMBs, and the causes and effects of currents.